AMD-01 is a device to generate and output signals necessary to drive active matrix OLED panels made with a-Si or LTPS. The device can be used for driving sample panels for evaluations in required test conditions and/or aging (burn-on). There are 6 channels output per block and there are 10 blocks. 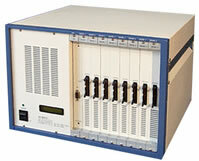 ( a total of 60 channels) One block can illuminate a panel or a sample. The signal output conditions can be programmed on the device via RS-232C port. *Cables or probes to drive and illuminate cells are not included.